ruthdelacruz | Travel and Lifestyle Blog : Do You Want to Own a Piece of My Favorite Things? Do You Want to Own a Piece of My Favorite Things? .. so I would give away this lip palette from Forever 21! 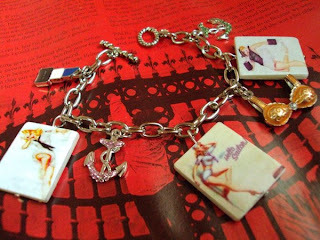 ... so a lovely follower would get to own this chic Pin Up Bracelet from Backstagevamp. I am still collecting and thinking of prizes to give-away. Unlike other blogs, I do not have sponsors for this contest, so I am personally picking up all the prizes that I would give away. (UPDATE!) I just received confirmation from one of the sponsors! Yeah. Contest details would be posted soon! Keep on following - the first follower to post a valid entry wins a special gift! © ruthdelacruz | Travel and Lifestyle Blog : Do You Want to Own a Piece of My Favorite Things?